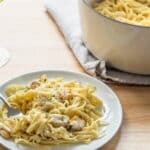 This Chicken Alfredo pasta recipe combines everything all in one pot for an easy comfort food meal. The pasta cooks right in the sauce. 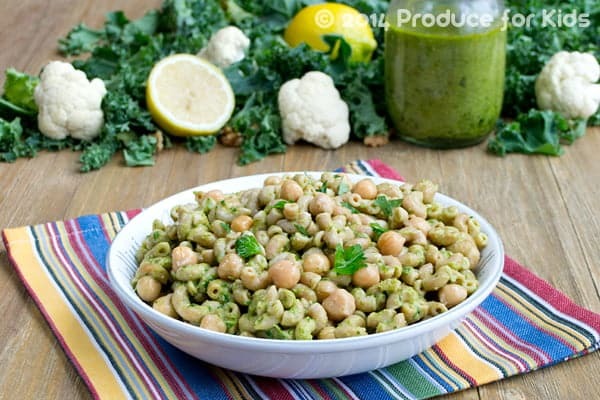 Have you ever tried a one-pot pasta recipe before? All of the ingredients go into one pot, including the pasta. The right amount of cooking liquid is added so that when the pasta has cooked, the dish is ready to eat and all of the liquid is absorbed. 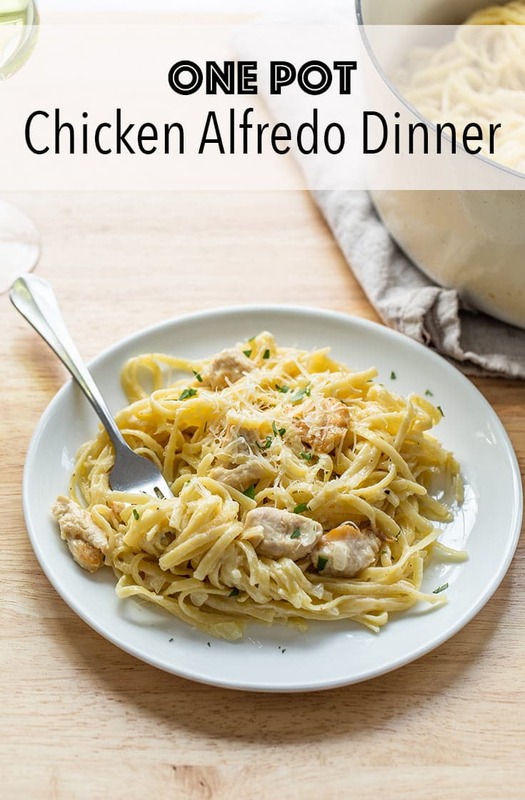 With this Chicken Alfredo recipe, the pasta finishes cooking and all you have to do is stir in a bit of Parmesan cheese and voila! Dinner is ready in a flash. Can you believe that? You’re just going to have to try it out yourself to be sure. 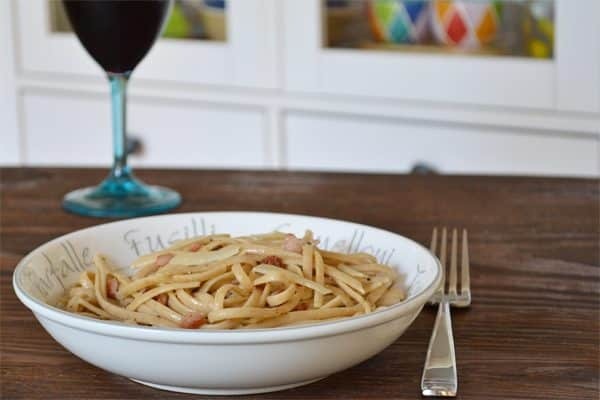 This recipe is a cross between the traditional Italian Fettuccine Alfredo, which has a lighter sauce, and the beloved but Americanized Fettuccine Alfredo. The sauce is a bit lighter than the Italian version yet not as thick and creamy as the Americanized version you may be used to. It’s really the best of both worlds. You’ll first cook cubes of chicken breast in the pot and set them aside until the pasta has cooked and you stir in the Parmesan. But, the flavor bits at the bottom of the pot are like flecks of flavor gold. No need to dirty more than one dish, you’ll want to be sure that gets into the dish. 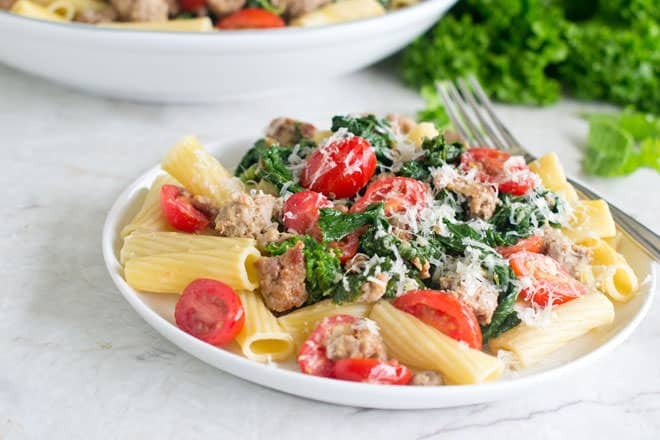 I know you’re going to love this recipe and use it all of the time when you need some comfort food on a weeknight! Enjoy! Place a large stock pot or a dutch oven or medium heat and heat the olive oil until hot, about 2 minutes. Add the chicken breast and cook until browned, about 10 minutes. Remove the chicken and set it aside on a plate. Add the butter directly into the pot, scraping the bits of cooked chicken off the bottom of the pot. Add the onion and garlic and saute until soft, about 5 minutes. Add the salt and pepper and stir. Add the water, heavy cream and pasta and stir. 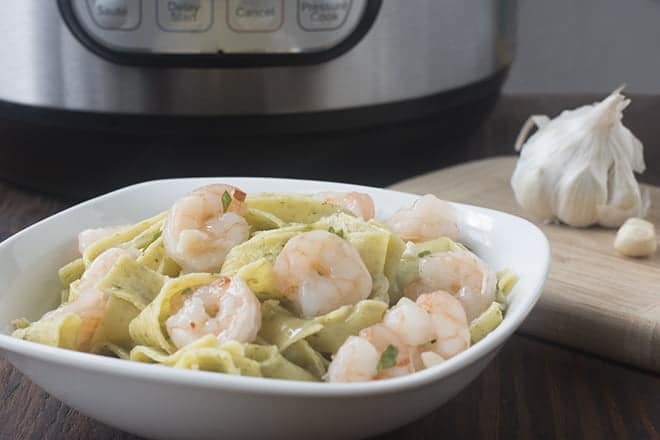 Allow this to cook, stirring frequently for 9 minutes, or until the pasta is al dente. 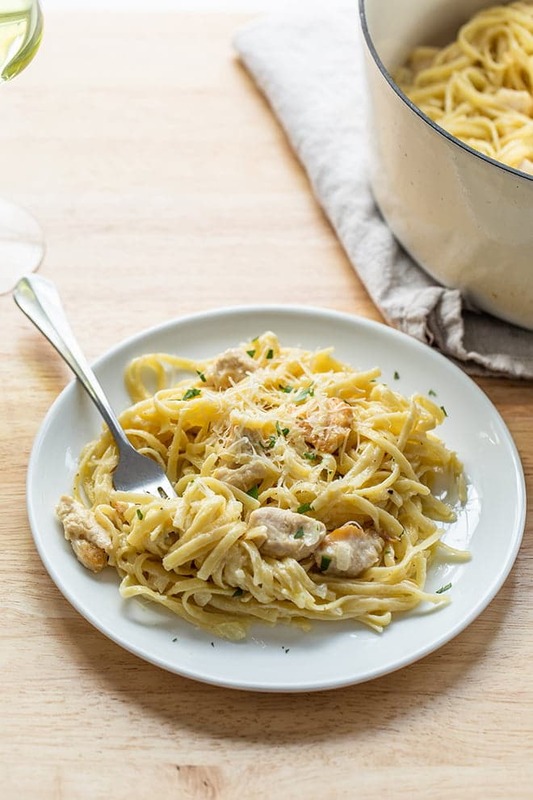 Stir in the cooked chicken and Parmesan.